This Thermomix Lasagna recipe is practically as staple in our house and thanks to it’s chunky meat sauce filling, I think it will become a staple in your house too! 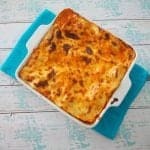 I’ve been making this Lasagna recipe for years now, but it has only been in the last 6 months or so that I converted it to make in my Thermomix. 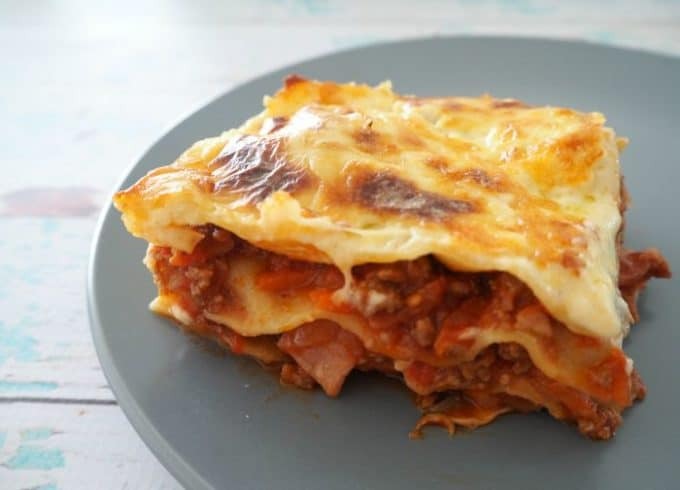 My kids could easily live on Lasagna if they were given half the chance, and admittedly they were eating it a few times a week after our littlest man arrived as I had cooked up and frozen a HUGE number of portions to give me easy meals during those early weeks. This recipe makes a nice big dish of Lasagna and you can bulk it up even further by adding extra veggies to the meat sauce mix. One of the best things about this recipe is that the meat sauce still remains chunky, which helps give a lot more texture to the recipe. When it comes to the veggies I add, I normally use whatever is in the fridge or pantry and in the past I’ve used pumpkin, sweet potato, carrot, zucchini and even broccoli with great success. If you don’t have a Thermomix, don’t worry! You can find the conventional instructions for this recipe here. My easy Thermomix Lasagna recipe has a yummy chunky vegetable and beef sauce which makes it a great way to sneak some extra veggies into the kids. It's also freezer friendly. Place the garlic, short cut bacon and brown onion into your Thermomix bowl. Blitz for 4 sec, sp 5. Add the olive oil and cook for 3 mins, varoma temp, sp2. Add the zucchini, carrot and sweet potato and blitz for 4 sec, sp 5. Blitz for longer if you want it finer. Add the crushed tomatoes, mixed herbs, water and tomato paste and cook for 5 minutes, varoma temp, speed 2. Place the beef mince into the steaming basket and break up with your spatula. Gently and carefully pop it into the TM bowl and cook for 8 mins, varoma temp, sp 3 REVERSE. At the 8 min mark, gently stir mince and cook for another 4 mins (or longer until it's cooked through) on varoma temp, sp 3 Reverse. Carefully remove the basket from the TM bowl and place into your Thermoserver. Add the sauce and stir to combine. Set aside until needed. Place 2cm cubed pieces of the tasty and parmesan cheese into a clean Thermomix bowl and blitz for 10 seconds on speed 10 or until finely grated. Add the butter, plain flour, milk, nutmeg and salt and pepper to your Thermomix bowl and cook for 7 minutes at 80 degrees on speed 4. Preheat your oven to 180 degrees and take out a large lasagna dish. Place a layer of pasta on the bottom of the dish and add 1/3 of the meat sauce. Place another layer of pasta on top before adding another 1/3 of the meat sauce on top. Repeat until you have used all of your meat sauce and have a layer of pasta on top. Pour the cheese sauce over the top layer of pasta and place the baking dish into the oven to cook for 35 - 40 minutes. Cut into pieces to serve. For more easy Thermomix Dinners, check out this collection of my favourite Thermomix Dinner Recipes post. 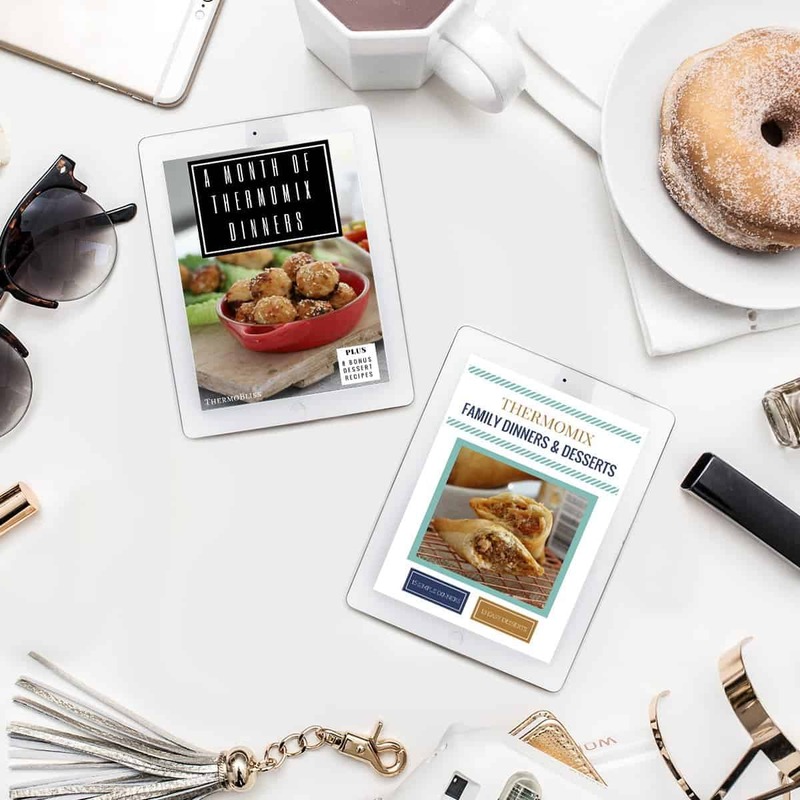 You can also find more Thermomix dinner recipe inspiration in our ‘A Month of Thermomix Dinners‘ and ‘Family Thermomix Dinners and Desserts‘ eBooks – these are also available in a Thermomix Dinners eBook bundle. Mine turned out like slop. Both sauces were super runny. What happened!? Hi Karina, Sorry to hear the recipe didn’t turn out well for you. Possibly the water content in the tinned tomatoes/mince may have added extra liquid to the meat sauce. In regards to the cheese sauce, it is a ‘runny’ sauce, however if you prefer it thicker, it does thicken if you leave it standing for 10 minutes or so. Alternatively you can also cook it a little longer. Have just made this ans if the mix is anything to go buy it will be wonderful. I made two smaller ones. 1 with gluten free lasagna sheets for me and cauliflower puree as the top and the other as per recipe. I use cayene pepper instead of nutmeg as my family loves it. Thanks for a great recipe with veg in it. At what stage would you freeze this? Also could I please have some reheating tips after freezing. I have a huge batch of frozen beef mince, which I need to defrost and use all at once! !